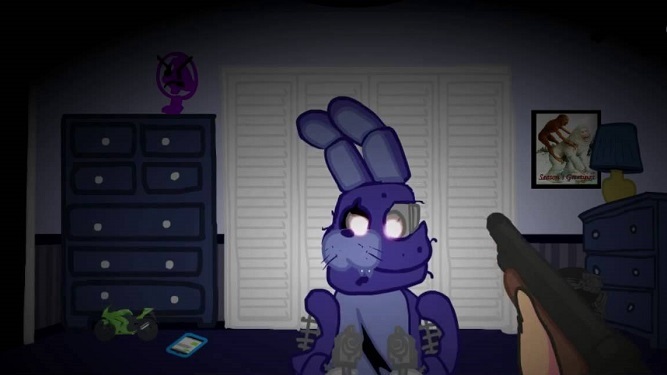 While playing Five Nights At Freddy’s, did you ever wanted just to have a big gun in your hand? So that you can blow those animatronic creatures away. Especially because they scared you so many times? Now in this Five Days at Freddys Game you can actually do that. You can blow up those creatures with your gun! This is a fan made game that is focus on the killing of that creatures. But like in most of the games in this horror-action game you have some rules. And in this one the rule is to be fast on the trigger. Because if you are too slow, animatronics will reach you and kill you. In this game your character is a boy that is tired from closing and opening the doors. It’s also tired from watching cameras all the time. This boy decided to take his dads shotgun and to teach this creatures a lesson once for all! This shooting-horror game you playing using your mouse only. 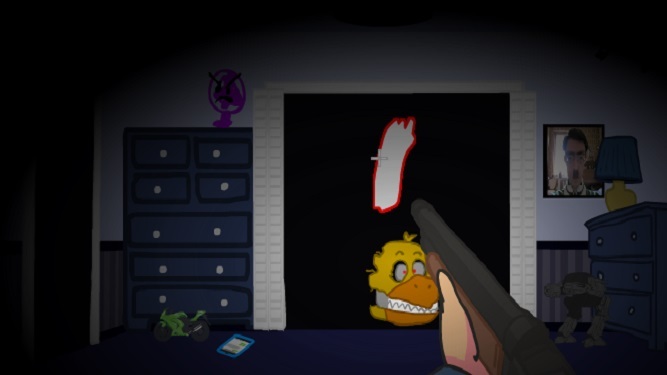 Your main weapon is your shotgun and you need to aim at animatronics. Move your mouse and shoot them by clicking the left mouse button. 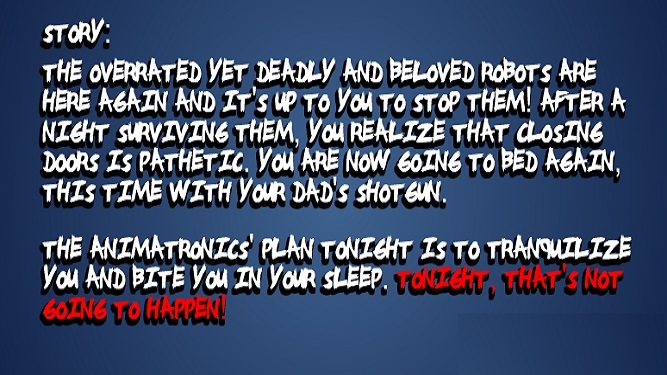 Your task is to kill all animatronic that are hiding in your room. They will come from different sides and you need to aim and shoot them fast. Remember the speed is the answer in this game. And if you are fast at the trigger you will win this game. In order to win this unblocked shooting horror game you need to clear your room from this evil creatures. By shooting everyone of them! Over time game will be harder and harder which means that you need to be very fast. Because if you make just one mistake they will eat you alive so be careful! If you are a fan of Five Nights At Freddy’s original games and if you ever wanted to shoot those evil robotic creatures. Then now is your chance in this awesome and challenging shooting horror game! This is a fan made game and they did a good job creating game like this. Now you have a chance to get rid of these animatronic once and for all by killing them! Closing and opening the doors and watching the cameras is in the past. Now it’s time for some shooting and killing! Show these creatures from what you are made of. Destroy them with your powerful shotgun!